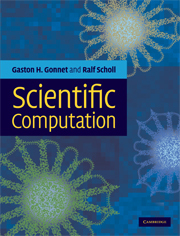 Using real-life applications, this graduate-level textbook introduces different mathematical methods of scientific computation to solve minimization problems using examples ranging from locating an aircraft, finding the best time to replace a computer, analyzing developments on the stock market, and constructing phylogenetic trees. The textbook focuses on several methods, including nonlinear least squares with confidence analysis, singular value decomposition, best basis, dynamic programming, linear programming, and various optimization procedures. Each chapter solves several realistic problems, introducing the modelling optimization techniques and simulation as required. This allows readers to see how the methods are put to use, making it easier to grasp the basic ideas. There are also worked examples, practical notes, and background materials to help the reader understand the topics covered. Interactive exercises are available at www.cambridge.org/9780521849890. Preface; 1. Determination of the accurate location of an aircraft; 2. When to replace equipment; 3. SSP using LS and SVD; 4. SSP using least squares and best basis; 5. SSP learning methods (nearest neighbours); 6. SSP with linear programming (LP); 7. Stock market prediction; 8. Phylogenetic tree construction; Appendixes; Index.